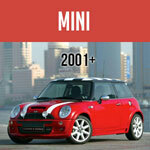 The Mini Cooper as built by BMC includes over 10,000 parts. Helping you find the exact part you need is very important to us. The On-Line Mini catalog is designed to help you be sure to find the part you need even if you don't know the name or part number. The catalog allows to simply visually find the part and thus lead you to a more detailed description and part number. 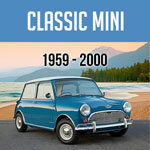 The Mini Mania parts catalog has been developed from original factory drawings andincludes all original parts, including many nuts and bolts. (After market and upgrade parts are listed on "Products" section of the website. Our on-line catalog system has a number of major divisions. The first catalog focuses on the 1959-1990 model range. The second catalog provides details for the 1990 and later models. We also offer a third insight into the very details of the Mini by way of the availability of a copy of the factory micofiche version of the catalog. The Factory Microfiche catalog is here.